After graduating from hotel school in Reims, Serge started his cooking career in the Grand Hôtel des Diablerets in Switzerland followed by a cook’s “tour de France” where he worked at the Hôtel Belles Rives in Juan-Les-Pins, the Hôtel des Frères Troisgros in Roanne, the Prieuré in Villeneuve les Avignon and then went on to some of the most renowned Michelin-starred establishments in France. Serge ran the kitchens of the Lana in Courchevel for 4 years and then moved on to the Château de Rochegude (in the Drôme department) which gained a Michelin star in 1987. In 1993 he also acquired a Michelin star at the Prieuré in Villeneuve les Avignon (in the Gard department) where he stayed for 19 years and obtained the distinguished title of Meilleur Ouvrier de France before heading off on a tour around the word. Serge Chenet belongs to the prestigious“Maîtres Cuisiniers de France” and the “Académie Culinaire de France” (the French Culinary Academy). He is also an international Culinary Consultant. 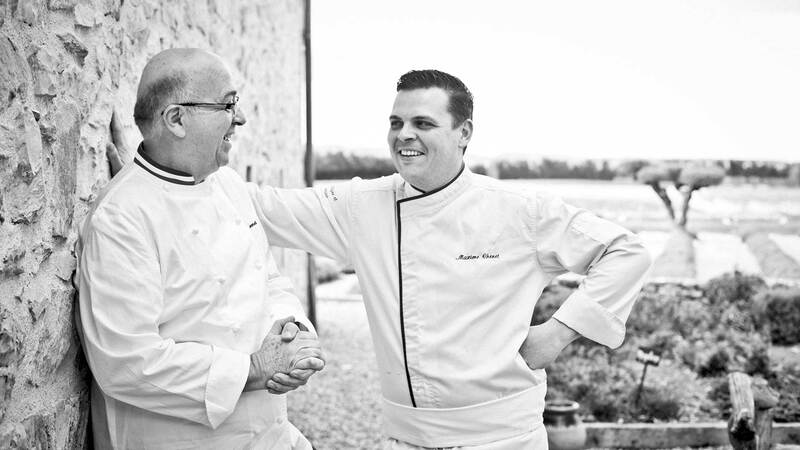 The president of the Chefs of the Gard department, Serge Chenet, his wife Maryse and their son Maxime opened “Entre Vigne et Garrigue” in May 2008 and obtained their first Michelin star in 2009. Chef Serge Chenet’s cuisine is delicate and heartwarming, showcasing the finest produce from local suppliers. Born in Avignon on December 20, 1985, it is no accident that Maxime Chenet tied on an apron and followed his father into the world of gastronomy. Maxime proved to be an extremely bright and talented student, obtaining his “Bac Technologique” at Avignon’s hotel school when he was 16, followed shortly after by his “BTS” hospitality business degree at the tender age of 19. He then completed several internship courses in some of the best restaurants in the country: Michel Troisgros in Roanne (3 Michelin stars), Le Jardin des Sens in Montpellier (3 Michelin stars), l’Hôtel de Paris in Monte-Carlo and le Cagnard in Cagnes sur Mer (1 Michelin star). Proving to be a quick learner, Maxime decided to also get his “BEP” (a more advanced diploma) in cooking. When he joined his father at the Prieuré in Villeneuve les Avignon, Maxime’s career truly got underway. From there, more of the top references in gastronomy were added to his portfolio: Les Airelles in Courchevel, The Raimbault Brothers’ L’Oasis in Mandelieu-La-Napoule (2 Michelin stars), then working for Jean-Pierre Jacob as chef de partie Au Bateau Ivre in Courchevel (2 Michelin stars) followed by the Ombremont in Bourget du Lac (2 Michelin stars) where he truly thrived in his profession. him the position of sous-chef for the winter season (Au Bateau Ivre in Courchevel), an opportunity he was quick to seize. Maxime’s resume is a well-earned one as he is talented, with good technical skills, passionate and level-headed, forming with his father a remarkable Chenet duo that blends tradition, creativity and modernity. After having worked hand-in-hand at “Entre Vigne et Garrigue” for several years, he now feels at one with his father’s cooking style, a father and son symbiosis resulting in many satisfied clients. After more than 26 years of working for Michelin-starred restaurants, Serge Chenet decided in his 50’s to pursue his own adventure and to create “Entre Vigne et Garrigue” on the former family farm in May 2008. Surrounded by a strong family team, Serge is accompanied in the kitchen by his son Maxime and front-of-house by his wife Maryse, who puts her touch on the interior decorating of the rooms as well as managing the reception area. Father and son work harmoniously together, sharing many moments and transmitting their experiences to each other. Michelin awarded them their first star in 2009, barely 8 months after opening. Their cuisine follows the seasons, the market and the best local ingredients available… the menus change depending on the chef’s inspiration, always seeking to enhance and respect the produce. For 10 years now, the restaurant has had two Chenet chefs in the kitchen, both striving for excellence with the passion and dedication that is bred in their bones.